How do I use the FullStory Console? The FullStory Console is available as part of FullStory Pro. If you do not currently have FullStory Pro, you can upgrade to a Pro plan within the app or schedule a demo to initiate a trial of the Pro plan which includes this Console feature. The FullStory Console view allows you to record messages reported in a customer's browser's console. 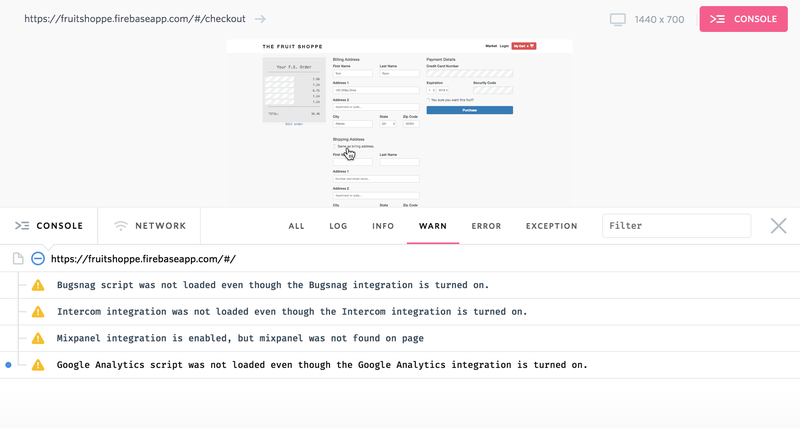 Developers use Console messages for debugging, and when FullStory records Console messages this allows you to see errors that occur "in the wild" so you can see exactly what happened in a customer's browser without needing to replicate. 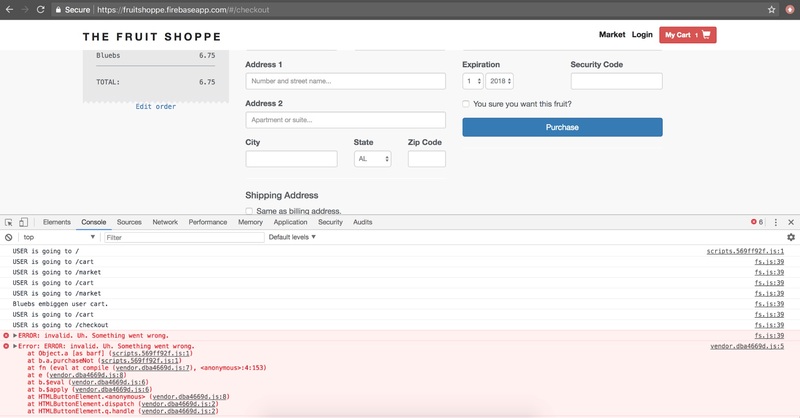 Similar to the Console in the developer tools of your favorite web browser, the FullStory Console enables you to see messages logged to the browser's console during any customer's session. 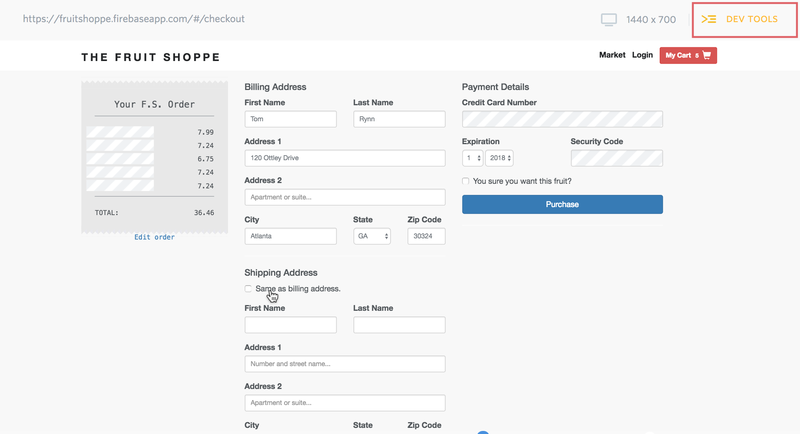 If you've never checked out the Console in your browser's developer tools, you should try it! In Google Chrome you can access the logs by typing "ctrl/cmd-alt-J" on your keyboard, or you can "right-click" and click "Inspect" to open the developer tools and then navigate to the Console tab. As you load or interact with any web page, the Console will log information, warnings, or errors as they occur during your session. Similar to the Console in a web browser, FullStory can record logged console messages as well as uncaught exceptions for any recorded session. This gives you the power to see what the Console logs looked like for any real customer. To enable Console recording for your FullStory sessions, first visit Settings > Recording > Recording Options and flip "Console Recording" to "on." Once this has been enabled, FullStory will begin recording the Console for future sessions. Once you have enabled Console Recording under Recording Options, you will see that the Console button (at the top right of your playback screen) will change colors when errors or warning are present. Note: if you have the Dev Tools add-on in FullStory, then this button that indicates errors or warning will read "Dev Tools" instead of "Console." ...and when you click to open Dev Tools you can see Warnings present in the Console. Note: If you have the Dev Tool add-on, you'll find the Console option as a tab when Dev Tools is open. Clicking the Console (or Dev Tools) button will show the state of the current page's console at the precise moment in time you're viewing. 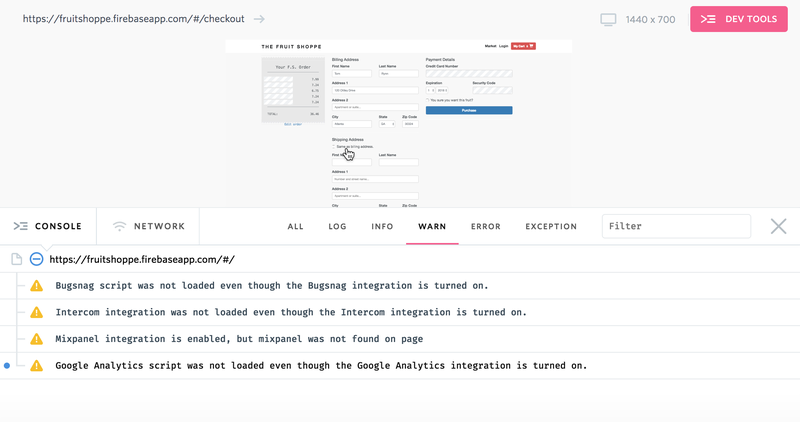 In FullStory, a single customer's session may include navigations to multiple pages, but the Console logs relate to a single URL—not the whole session. When the Console view is open, blue page icons will display on the timeline, to indicate events where the customer opened a new page. For sessions with multiple pages, use the blue (-) icon to collapse the waterfall chart for a page and the blue (+) icon to open a waterfall chart for a page. 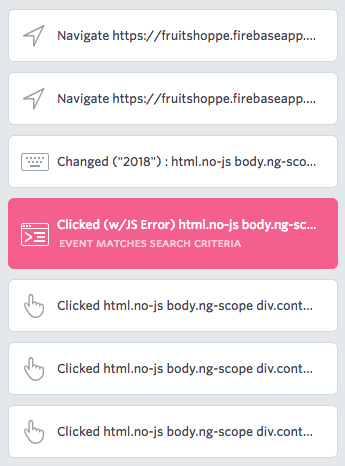 Pages in the Console view will correspond with "Visited Page" navigation events shown in the Event stream, and you can quickly find where console errors occurred within the sequence of events for a session by looking at the color-coded console icon in the Events stream. Log - Relates to console.log() and includes logged messages that might be helpful for debugging. Info - Relates to console.info() and includes logged informational messages that may be related to state changes or various services. Warn - Relates to console.warn() and includes logged warnings that could cause problems but are generally recoverable. Error - Relates to console.error() and includes logged errors that cause operations to fail. Exception - Includes uncaught errors; with Exceptions, you can click to expand and view a Stack Trace. ...or start typing in the Filter text area to narrow your search by text included in the Console message. What does "Script Error" mean? "Script Error" is what you see when the browser hides the precise origin of an error. This happens when the error occurs in a script hosted on a different domain than the site, and it's there for security reasons. Unfortunately, FullStory can't give you any further context than what is passed to us so you may sometimes see "Script Error" in the FullStory console. What console messages doesn't FullStory capture? There are some messages that browsers display on their respective developer tools' consoles, but which aren't technically console messages, and thus unavailable to FullStory. These include things like deprecation warnings, and certain kinds of security and network errors. Can I control this behavior? When FullStory is recording console messages, and you're using the browser console yourself, you will see messages attributed to "fs.js". While this doesn't affect the user's experience in any way, it can make debugging a bit more difficult. If you want it to get out of the way, simply call FS.disableConsole() on the console (you can re-enable it with FS.enableConsole()). If you want to turn it off for all pages, you can do so using the toggle in Settings > Recording > Recording Options. FS.log() provides a way to silently log messages to FullStory console, without logging the message to the user's browser console. See FS.log for additional information. Ready to use the FullStory Console? The Console view is part of FullStory Pro. If you don't already have a FullStory account, you can sign up free to try the Console today. If you're currently on a FullStory Free plan, you can upgrade to Pro within your subscription settings or contact us to request a trial of a Pro plan to start working with the Console today.